I have a monstrous amount of variegated top. I love my stash. I love touching and staring at it. I love adding to it. Now I buy 4 or 8 oz of fiber instead of a t-shirt when I go traveling. Most of my stash is in 4 oz increments, 8 oz of one colorway if I'm lucky, Not really enough to spin for a big something. Plus, there is the phenomenon where I loved it when I bought it, but now, not so much -- the colors aren't quite right. Two quick ways that I stretch and/or rescue no longer quite so loved variegated tops is by combining them with either natural colors or other variegated tops. I combine them by plying or by drafting them together. It's quick, it's easy and I end up with something newish, which appeals to the five-year-old in me. Plying and drafting together give two different effects in the finished yarn. If the colors are very far apart in dark and light (like black and white), the new yarn will look very barberpoled and if the colors are close (medium gray and dark gray), the yarn will look muddled. I usually try for something in between those two extremes. Plying and drafting together also give two different effects in knitted fabric. Plying gives a more defined striped look than drafting together. The knitted fabric of drafted-together yarn has softer edges to the stripes and a more speckled look. Plying for combining colors or fiber is just regular plying. I spin two singles and ply them together slightly over twisted, because I like how it looks. I used a two-ply for my samples here, but the color play can really change with multiple plies. Learning to draft two separate tops together took a little practice and a little predrafting for me, but once I had the feeling, it was easy. When I draft a dyed top and a natural top together, I use less of the natural than the dyed top. I find that equal amounts of the natural can drown out the colors in the variegated top. If I strip a dyed top into 6ths to draft, I would strip a natural brown into 8ths. With two variegated tops, I use equal amounts, usually stripped to a finger's width -- a 6th or an 8th of a top. I hold the two strips of top that I want to draft together, side by side. I've done it stacked too, but I like the side by side better. If the fibers are compacted or very different fibers or fiber blends, I will predraft them slightly together to start the combining. 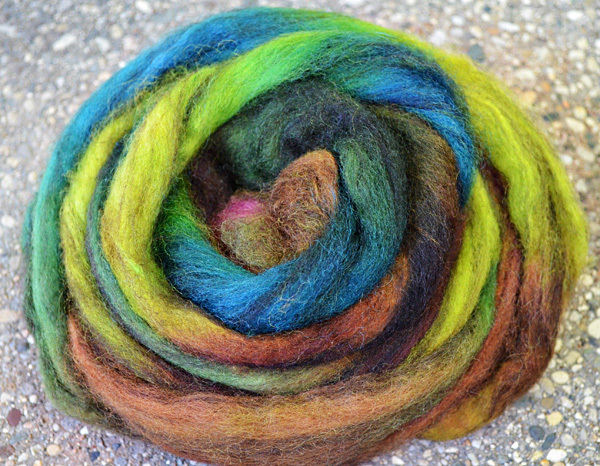 This particular top was dyed on a mixed BFL base, so it has extra depth. 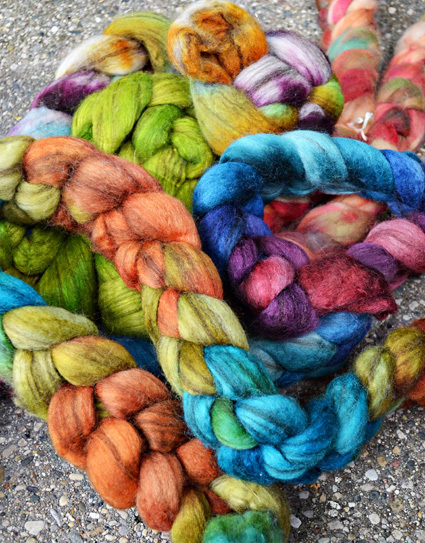 I wanted to know what would happen when I plied and mixed it with three different colors of natural BFL. With naturals, it's pretty simple. If I want the overall effect to be lighter, I use a lighter fiber; if I want it darker I use a darker fiber. Using a natural does take away from the overall colors: it washes and softens them overall. 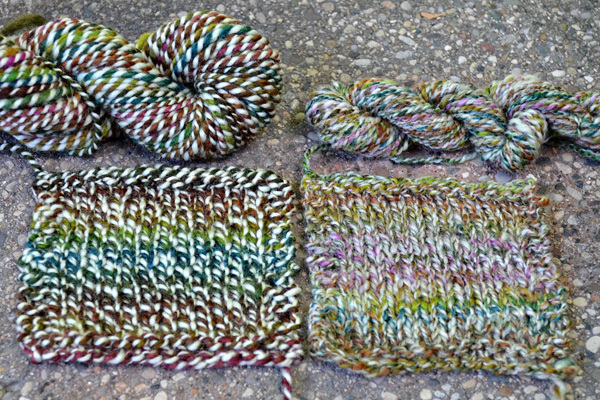 The plied yarn and knitted sample are on the left, the drafted together yarn and knitted sample are on the right. Laurelhurst blended with white (top), mixed (middle) and blue-black (bottom). 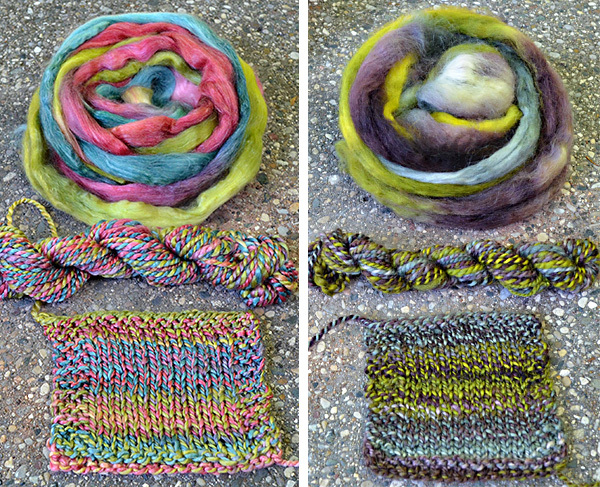 All of the samples on the left are mixed by plying; the samples on the right are mixed by drafting together, then plied. You can see the stark effect of the white vs the darker naturals, and the crisper stripes in the plied vs drafted-together samples. As far as liking goes, I don't have a clear winner. With the white and mixed, I like the drafted-together sample, but with the dark I like the plied. 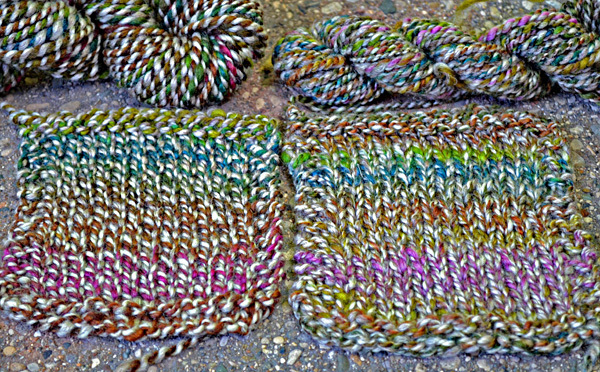 For my variegated top samples I used two Cjkoho Fibers tops. 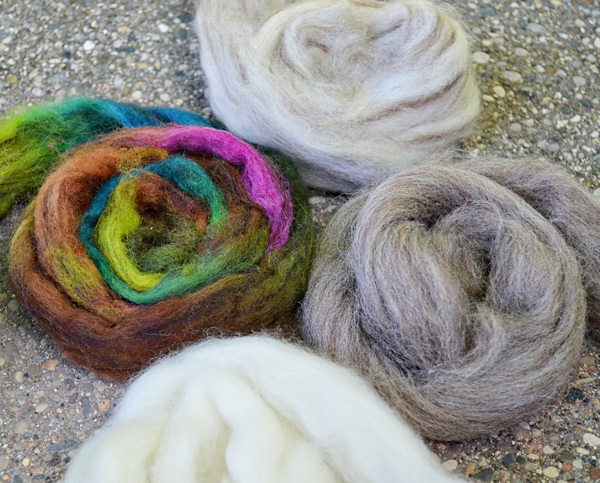 I mixed up the fiber blend for these samples too. I used Jillian, a Merino/Tencel blend, bright and shiny, and and Cameron, a BFL , darker. Cjkoho Fibers: Jilian on Merino/Tencel (left); Cameron on BFL (right). 2 ply plyed on itself and the knitted swatch. 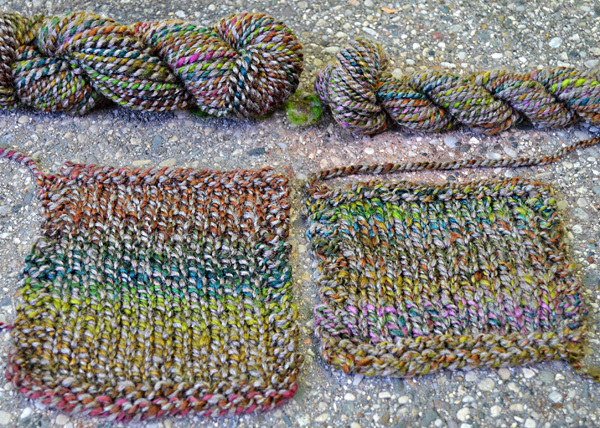 When I combine variegated tops, I let the dyers of beautiful things do the work for me. I just look for like colors within the tops. With Cameron and Jillian, at first glance I wouldn't put them together, but they kept poking my spinning curiosity. Then I looked at the individual colors and noticed they have a dark lime green in common. It's a little lighter in the Jillian colorway, but they are close enough. 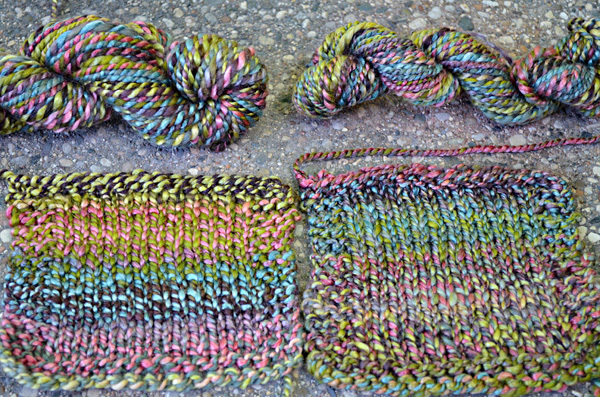 Cjkoho Fibers: Jillian and Cameron plied together (left); drafted together, then plied (right). The result was exciting! I will admit I like the drafted-together sample better between these two. With two variegated tops, I can really see the striping magnified in the plied sample vs. the speckles and softer edged stripes in the drafted-together sample. Another thing I really like is the sheen of the tencel (50% in the merino/tencel blend) which gives the sample a deep gleam. I thought the shine would get swallowed by the Merino and the BFL. Because of the different fiber blends in these two tops, I stripped into 6ths, held one strip of each together and attenuated a little, just enough for the fiber to catch, to shake hands. 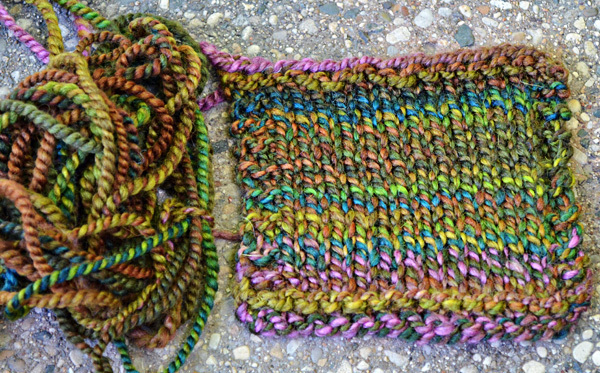 I like how I never quite knew the outcome of this experiment until I knitted a swatch. It's one of the things about spinning that I never get tired of. The fiber keeps transforming through each stage and I never know how or, if, I will like it until I've knit with it. Of course with every sample I did, I thought of about three other ways I wanted to try things, adding more than two colors, different drafting techniques, different fiber blends. These experiments are completely addictive. Now I'm putting together combinations of fibers and tops going back years in my stash, even fibers that I had relegated to the batt making pile, and coming up with sweater quantities of lovely yarns. Jillian Moreno is the editor of Knittyspin. 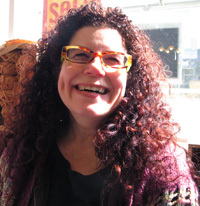 She's on the Editorial Advisory board for PLY Magazine and is teaching at Rhinebeck this fall. She lives in a house packed with fiber and books. Be warned, she's a morning person and is disgustingly chipper before 9 am.